On 19th of August, 2014 Prof. Roald Hoffmann, a Nobel Prize winner in Chemistry, will conduct the public lecture “Chemistry’s Essential Tensions: Three Views of a Science in Culture”. The lecture is organized by Samara State University and Samara Center for Theoretical Materials Science in collaboration with the Fock Meeting on Quantum and Computational Chemistry within the Megagrant of the Russian Government. Mr. Roald Hoffmann is the Frank H. T. Rhodes Professor of Humane Letters Emeritus, at Cornell University (Ithaca, USA). He received the Nobel Prize in Chemistry (1981, jointly with Kenichi Fukui) for their theories, developed independently, concerning the course of chemical reactions. Prof. Hoffmann contribute to chemistry could be called “Applied Theoretical Chemistry”, a particular blend of computations stimulated by experiment to investigate both organic and inorganic substances, molecules or solids. With R. B. Woodward developed rules for elucidating organic reaction mechanism (the Woodward-Hoffmann Rules) and introduced the isolobal principle. 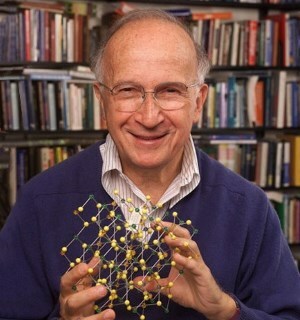 He is a winner of prominent awards from the American Chemical Society, the US National Academy of Sciences, the American Crystallographic Association, the Russian Academy of Sciences RAS and many others. He is also foreign member of the RAS. Prof. Hoffmann is author of numerous scientific publications in Chemistry, as well as popular scientific, philosophic and poetic works translated into several world’s languages. He is co-host of TV series on introductory Chemistry “The World of Chemistry” aired in the 1990s. The series is widely used in teaching Chemistry at American high schools and universities as well as abroad. Prof. Hoffmann strongly contributed to promotion and interpretation of Chemistry to society, discovering in his publications and lectures its social, cultural, psychological and artistic dimensions. Samara State University invites all interested to attend the lecture, which will be held at 7:00 pm at the conference hall of Renaissance Hotel (162B, Novosadovaya St.) on the 19th of August. In this generously illustrated lecture several views of chemistry will be presented, stressing its artistic and psychological dimension: First of all, chemistry is, as it has always been, the art, craft, business of substances and their transformations. It is now also the science of microscopic molecules, both simple and complex. And then there are people’s perceptions of chemistry - the ambivalence about benefit and harm that figures in these perceptions may be viewed as a problem, but it is also a life-giving tension. For it is the way we feel about people too. The underlying psychological tensions of chemistry will be explored, as will the strong element of creation or synthesis in chemistry, which brings chemistry close to the arts. R. B. Woodward and R. Hoffmann The Conservation of Orbital Symmetry, Verlag Chemie and Academic Press, Weinheim and New York, 1970. R. Hoffmann Solids and Surfaces: A Chemist's View of Bonding in Extended Structures, VCH, New York, 1988. Translated into Russian by A. L. Tchougreev, Mir, Moscow, 1990. Roald Hoffmann and Vivian Torrence Chemistry Imagined, Smithsonian Institution Press, Washington, 1993. The Same and Not the Same, Columbia University Press, New York, 1995.